Shrinking a knitted object with hot water and agitation actually defines the process of fulling. We refer to it as felting because it is commonly referred to as such in the hand knitting community. By definition, felting uses unspun wool to create a cohesive fabric. 1. Use the hot water wash and standard agitation settings of a top loading washing machine. Set your washing machine for a medium or large load. Pour 3 to 4 tablespoons of liquid laundry or dish washing soap in the machine while it is filling up. 2. Put in your project to be felted and an old pair of jeans or a couple old bath towels (for abrasive action). Note A: If your project is small or unusually shaped (especially if it has handles or straps), it is best to place it in a mesh garment bag or even in a pillow case and secure the opening of the case closed with safety pins. This will keep your project from getting stretched out or wrapped around the agitator core. 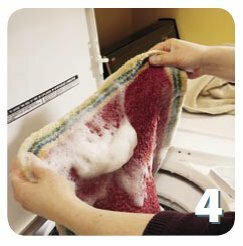 Note B: Make sure that whatever you include in the load to provide the abrasive action (like jeans or old towels) is old enough that it will not produce lint of its own, which would have the potential to felt into the surface of your project, and will not bleed unwanted color onto your project. 3. Run through the agitation cycle. If your washing machine does not have a hot rinse option, and since cold water immediately stops the felting process, stay nearby and stop the washing machine before the rinse cycle begins. 4. It may take several hot wash cycles to fully felt, so check your project at the end of the first hot wash cycle. If the fabric is still stretchy at all or if you can clearly see the knit stitches, you will need to run the project through a second hot wash cycle, and maybe a third. Adding more soap for repeat cycles is not necessary, but if you think your project still has a long way to go before felting, you may want to add more soap. Felting usually goes very quickly at the end, so be careful not to overdo it with the soap or you might have an overflow of lather. 5. 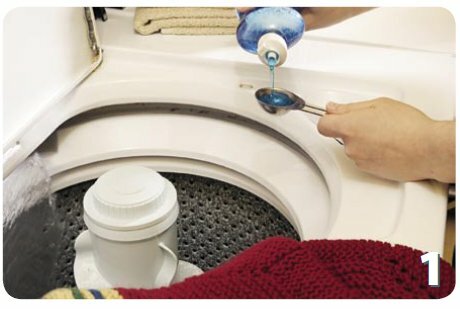 Once your project is fully felted, let it go through a cold rinse cycle and spin out the excess water. 6. Lay the project on a large, old towel. Pull out and finger press into the desired shape, pinning if necessary. If you are blocking multiples of an item, measure each one to make sure they are all the same size. If the item is three-dimensional, stuff it with wadded up plastic bags or smaller hand towels to help it maintain the desired shape while drying. Be careful not to overstuff—leave room for air to circulate so it will dry quickly. 7. 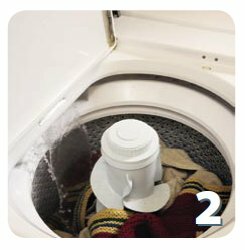 Remember to wipe out your washing machine drum and clean out any lint traps. Felting produces a lot of lint that you probably don’t want to share with your next load of laundry. The speed and degree to which a project will felt depends on the combination of several factors. A) Temperature of water—the standard hot water setting for most washing machines will usually work. If you find that several cycles through your washing machine still does not accomplish the degree of felting you would like, you might try adding a kettle of boiling water to the hot wash cycle to increase the temperature. B) Agitation—every washing machine has its own personality. You will learn how aggressive yours is through experimenting. 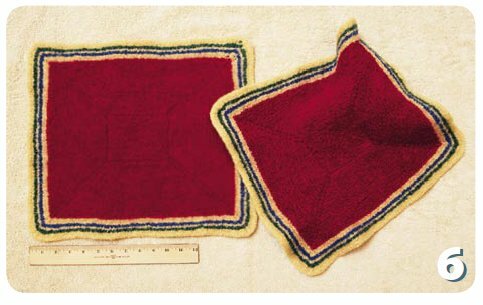 It is very normal to need to put a project through several agitation cycles to accomplish the degree of felting you prefer. C) Size of project—very small projects are difficult to felt in a washing machine because they do not have the surface space available to respond to the agitation. If you want to felt a very small or delicate project, you may want to try hand felting. D) Fiber content—All animal fibers will felt: wool, alpaca, camel; silk is the exception. Yarns that have a blend of animal fiber with a plant or synthetic fiber MIGHT felt, depending on the percentage and type of fiber, the type of blend (intimate vs. plied) and the yarn construction method. The best way to know how or if a yarn will felt is to knit a test swatch and put it through the felting process. Sometimes these yarn blends will produce very interesting textures since part of the yarn felts while the other part does not. E) Color of yarn—bleached yarn (whites and creams that are obtained by bleaching rather than dyeing) will not felt. The bleaching process renders the tiny scales that normally interlock during the felting process inactive, so the fibers will not mesh together. If you are designing your own felted project, or are substituting for a pattern’s recommended yarn, you will want to knit a test swatch and put it through the felting process. Be sure to measure your swatch in both directions before felting it and again after you felt it—so you can calculate how large you will need to knit your project in order to get the size you desire after felting. Generally, stockinette fabric shrinks more in height than it does in width when it is felted. This entry was posted in Felting, View All by Knit Picks Tutorials. Bookmark the permalink.